BEST PRICE GUARANTEE. If you can find another similar available property cheaper which will sleep 10 then this will be matched. New Mediterranean style Istrian stone villa built as part of a prestigious development set amongst picturesque countryside. The accommodation has been fully fitted with high quality Istrian designed oak furniture which matches the traditional rustic style of the villa. 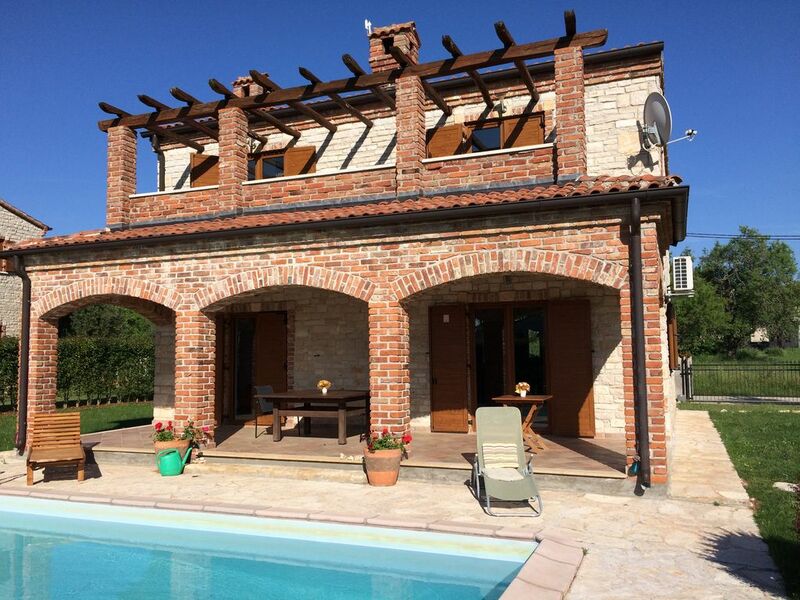 The villa is built of Istrian hand crafted stone and combines modern and traditional materials. Wooden floors, oak staircases, terracotta floor tiles, open stone fireplace, oak beams, ceramic terrace and pergola style large balcony are all key features. Each bedroom has been colour designed to provide traditional and contemporary colours. A blue Mediterranean style to match the Adriatic, a green fertile colour of the Istrian countryside and ivory to reflect the warmth of the sun. Outside the villa excels with spacious terrace, private pool, walled and hedged secluded garden with shrubs and olive trees. There is an Istrian hand built Bar b q. The terrace, pool and garden are excellently maintained and provide a range of places to relax and have fun. Easy access to tennis which is free. Outside features: The walled garden is 650 sq.m. in size surrounding the villa with lawn throughout, olive trees, private pool (8x4m), BBQ area, outdoor table, chairs, teak loungers and deck chairs. The villa is south west facing and therefore receives the sun all day. The terrace is large and spacious and can be used to eat outside as can the first floor pergola style balcony which has views towards the Adriatic and Brijuni. There is space for two cars and the villa is gated with cast iron gates and uses a secure system. Shrubs and trees are a feature of the garden as it has now matured. The private pool is maintained on a regular basis during your stay making your stay stress free. Istrian pools are normally not heated from April until October due to the warm temperatures at this time of the year. Average temperatures range from the low to high twenties. Typical temperatures in May or September are 24oC - popular months to visit. Amenities: Pula is 15 minutes drive and is the largest city in Istria. It offers a town of antiquity, parks, summer festivals and the sixth largest amphitheatre in the world. It is an attractive place to spend a holiday and provides 2,350 hours of sunshine per year, high quality restaurants and cultural events. The villa is within easy distance of the popular coastal towns of Rovinj (15 km) and Fazana (8 km) which gives access to the famous Brijuni Islands. Trips to Venice (2 hours) are a common feature of many peoples holiday. Istria is popular inland for its unspoilt nature, fertile landscape, pine forests, rolling hills and hilltops towns such as Motovun, Groznjan and Oprtalji. It is referred to as the 'New Tuscany'. All are within 30 minutes. Popular activities include riding, fishing, swimming, diving, water sports, tennis, cycling, walking, sailing, vineyard and olive oil trails. The villa has comprehensive details about a whole range of activities and trips. Coast and beaches: The nearest coast and beach is just 8km from the villa. All coasts are easily accessible to the East, West or South by car. Beaches have crystal clear water and can be reached in 10 - 20 minutes depending upon the exact location. All beaches are family friendly and are often backed by sweet smelling pine trees. Popular beaches are near Rovinj which is one of the most beautiful places in Istria, Fazana with its access to the Brijuni National Park and Medulin with long stretches of sandy beach. Hidden beaches at Duga Uvala and Kamanak Peninsular are within 20 minutes drive and exceptional. Vodnjan is the nearest town (5 mins) and is famous for its exquisite wines and renowned olive oil which have been produced for centuries. The town has many ancient traditions characteristic of a Medieval and rural centre. It is a bilingual centre and has both Istrian and Venetian influences. All amenities are easily available including a wide range of restaurants, shops, bars, banks and ATMs. Konzum is a good local supermarket, Girotondo is a popular restaurant, bar, cafe and pizza place and Vodjanska one of the best restuarants in the area. Agrotourism Sia is close to Vodnjan with excellent local meat such as lamb, fresh grown vegetable and own wine at a reasonable price. Bathroom 1 with large luxury corner bath, shower, wc, bidet, fitted cabinet and radiator. Bathroom 2 with shower, wc, bidet, fitted cabinets. Both bathrooms are large, spacious and fully tiled throughout. The villa has two units. One upstairs and one downstairs. They also provide heating. There is oil central heating through the villa. It is controlled by a thermostat with radiators in each room. All linen is provided for beds once a week. There is a washing maching with powder provided. Two external dryers are provided. The villa has a wood burning fireplace in the living area. It is also a bar b q. Secure parking behind locked gates which are sensor operated. Two towels are provided per person. Beach towels are NOT provided. The villa has a spinning machine for cycling and personal fitness. Italian coffee makers are in the villa. There is a coffee machine for filter coffee if preferred. The villa is provided with tea, coffee, sugar, spices, oil, grappa, wine, beer, fresh milk, fresh fruit, still and sparkling water, juice, biscuits and beer on arrival. Additional items also provided. The villa is well stocked with plates, glasses, pans, and general cooking utensils. Enough for 10 people. The kitchen provides space to cook and dine inside. There is an external hand built traditional bar b q. There is an inside expandable oak table suitable for 10 person. The outside wooden table will sit 12 easily. There are selection of books available. The garden has olive tress, shrubs, hedges on two sides and is maintained all the year round. Guests comment on the privacy of the garden. And also the green grass. The is a full pergola style balcony from bedroom 1 and 3 with views. The villa has a ground floor shower and bedroom suitable for wheel chair users. The bathroom is not fitted with hand rails or specialist equipment. Access to the villa or terrace involves a small step. A popular feature in front of the terrace. The villa has an open plan fully fitted modern kitchen with cooker, ceramic hob, fridge/freezer, washing machine and dishwasher. A traditional oak table and matching dressing table provides a luxurious dining setting. The extendable oak dining table seats 10 easily. The terrace has a very large hard wood table for 12 by the pool. The modern living room has 6 seater leather sofa and a double sofa bed. The living room leads onto the large terrace, traditional wood burning BBQ, private pool, spacious walled garden and area with large table, chairs, 4 luxury teak sun loungers, 4 sun loungers and 3 deck chairs. The south wast facing aspect of the terrace and pool provides spectacular evening sunsets and dining. The property has been designed by one of Istria's leading developers who have been building traditional stone villas for over 25 years. Thank You for taking the time to review the villa. The villa continues to be popular and every effort is made to make it like home. The welcome pack of wine, local oil, fruit, fresh juice, fresh milk, beer and other provisions helps to make it welcoming. It is a great area to be as a family with dogs. Look forward to you visiting Istria and the villa again. This was our first visit to Croatia and we were not disappointed. The villa was excellent very clean with lots of homely touches including the very helpful hints and tips in the welcome pack to help make our stay more enjoyable. I would recommend exploring the local restaurants as food quality is excellent at reasonable prices. Lots of delicious meat and fish dishes with an Italian influence. The property is without doubt 5 star rated - fully equipped and complete value for money. The owner, Chris was very helpful with information on local areas and things to do, also flexible to suit our flight times - which is a big tick in our box. There were 6 adults in our group and what we paid each for the week, you couldn't of afforded a bedsit back home - instead we had a week in complete luxury. We all thoroughly enjoyed our stay and were sad to leave the place behind. Our families had a great time in this property! We spent our holiday in this really nice holiday home with two families (4 adults and 4 children). The house is perfect for 8 persons (due to the 4 bedrooms, 2 bathrooms and fixtures). It is a really great house, nicely furnished, everything was clean, we had enough towels and the pool is perfect! We were enthused by the "arriving package". When we arrived at the house, some food was already there, e.g. milk, wine, olive oil, juice, water and many fruits, as well as useful things as salt and pepper, sugar, detergent tabs, dish liquid and paper towels etc. We went to Motovun - a beautiful little town at the top of a hill. We recommend to park at the bottom of the hill (there are parking slots at no charge at the right side before the "official" parking area where you have to pay) and walk up. It is a really nice town with winding alleys, restaurants and a great view. Our second trip has been to Rovinij. This town at the sea side is really beautiful with many restaurants, shops, old buildings and many things more. Go and visit! The owner has been friendly and helpful at all times. Thank you Chris for a great stay in your house! Die Außenanlage der Villa ist sehr gepflegt. Jeden zweiten Tag wird der Pool gereinigt. Auf dem großen Tisch der Terrasse können zwei Familien ausgezeichnet speisen. Hinter dem Haus befindet sich ein Tennisplatz. Der Bereich des Ferienparks mit diversen Villen ist sehr ruhig. Der schriftliche Mailverkehr mit dem Eigentümer war ausgezeichnet und verlässlich! Man kann zahlreiche verschiedene Küstenstrände, wie z.B. Duga Uvala, oder den Naturpark Kamenjak genießen. Im Naturpark kann man sich dem Wassersport widmen. Wasserschuhe, Schnorchelset's und gute Flossen sollten mitgebracht werden. Das Wasser war sehr klar und frei von Algen etc..
Rovinji (schöner Stadtkern zum Bummeln), Pula (Amphitheater) und Novigrad sind sehenswert. Das Essen außerhalb war nicht überwältigend. Insgesamt hatten wir, neun Personen (4 Erwachsene u. 5 Kinder) einen schönen und erholsamen Badeurlaub in Kroatien. Die Villa mit Pool in Vodnjan können wir jedenfalls definitiv weiterempfehlen !!! Saubere Pool, die ruhige Lage, der gepflegte Garten, die hervorragenden Küche, große Terasse, der Tennisplatz und ausgezeichnet speisender. All das ist sehr angenehm und beliebt. Duga Uvala und Kamenjak sind wirklich zum Schwimmen sehr empfehlens wert und gut zu erreichen. Schön, dass du gut dorthin gefunden hast und begeistert warst von der Wasserqualität. Danke für die Empfehlungen über Rovinj, Novigrad und das Amphitheater. Dank der guten Straßenanbindung der Villa sind vieleTeile Istriens sehr gut und schnell erreichbar, auch in der Hauptsaison im August. Die Gäste sollen das Gefühl haben, sich gut aufgehoben zu fühlen. Von der Buchung, über die Anreise bis zum Aufenthalt. Vielen Dank für die positive Bewertung und die gute Kommunikation über Email. Es ist mir wichtig in der Villa eine Erst-Ausstattung wie frische Milch, Wasser, einheimisches Olivenöl, Wein und Grappa bereitzustellen. Dann kann der Urlaub sofort beginnen! Liebe Thomas. Vielen Dank, dass du dir die Zeit für diese Rückmeldung genommen hast. Clean pool, quiet location, well maintained garden, excellent dining area, large terrace in front of pool and tennis are all very popular. Every effort is made to contact guests quickly and with clear detailed information. It is important that guests feel re-assured when they book and before they arrive. Thank you for commenting on the excellent written email communication. On arrival I provide a villa which is ready to use with basic provisions, wine, water, fresh milk, local oil and grappa and with instant access and use as soon as you arrive. No waiting. The swimming at the beaches of Duga Uvala and Kamenjak are two I highly recommend and are easy to reach. Glad you found them and confirmed that the water is very clear. Thank you for the recommendations about Rovinj, Novigrad and the amphitheatre. The villa is well located to get to many popular parts of Istria. The new road helps and it is relatively quiet even in August! Thank you Thomas for taking the time to write about your experiences. Our family had a lovely week at the villa. It had all the space we needed and was clean and well-maintained. The villa was in a good location for exploring some of the nearby beaches and towns, we only wished we had visited Rovinj sooner as it had lovely streets to wander down and explore and a good choice of restaurants. We chose to fly to Slovenia and drive from there and the directions provided by the owner were very easy to follow, be prepared for an hour or two delay crossing the border at the weekend, but no other problems. We loved the terrace and the kids loved the pool and we would certainly revisit and recommend the villa to friends. Yet again the pool, terrace and the spacious secluded garden are popular features which people love. Rovinj is popular with everyone. A special place with an easy drive form the villa. I am always recommending Novigrad which has many features similar to Rovinj but it is a little further. I will recommend Rovinj - it can also be arrived at by boat as part of a one day trip. Guests this year were picked up at the villa and thoroughly enjoyed the day and the whole package. Saturdays from late July until late August have been busy at the border after Koper. It is the route everyone seems to take. I have now sourced an alternative route which is about the same distance but uses a less well know passage from Slovenia in Croatia. I have tried it recently and there were few cars waiting at the border. I will recommend this in future for Saturday guests. Thank you Fiona for highlighting some of the key places and experiences which can benefit others. Glad to see you are recommending the villa to friends and look forward to you visiting again. Location is close to the famous Brijuni Islands National Park, lively Pula, ancient Vodnjan, chic Rovinji and the stunning Adriatic coast. This incredibly well situated property is in the heart of the rich fertile Istrian countryside with its vineyards and olive groves. The villa combines a peaceful and communal setting together with easy access to major attractions and amenities. Combine the local Venetian influenced Istrian cuisine with your own cooking on the barbecue. The villa has views of the Brijuni Islands from the first floor pergola style balcony and has its own traditional stone fireplace for wood. Air-conditioning and central heating are provided. The villa allows both a rural and coastal holiday any time of the year. Golf: A brand new Jack Nicklaus designed course is being developed within 15 minutes of the villa and is due for completion in 2015/16. This will make the villa a desirable location during the winter as well as the summer months. There is also a golf course on the Brijuni Islands a 10 minute boat trip from nearby Fazana. Ski: There are two ski resorts which can be used in the winter season. Platak north of Rejeka is a 2 hour drive. Further inland is Bjelolasica. Both of these resorts provide opportunities to experience both rural Istria and skiing in the winter. There is plenty of skiing in Slovenia which is easily accessed by flying to Ljubljana if you want to have a two resort break. This is becoming popular. Security deposit taken on arrival. Local taxes are 1 euro per person per night with discounts for children under 18 and free for children under 12. There is a 4 euro registration fee per person. 35 kuna. Price includes pool and garden maintenance. Towels, linen and cleaning is once per week. The villa shall be stocked with basic provisions as well as fresh milk, water, local wine and olive oil.